This demonstration shows you aome more advanced effects you can accomplish with the Galleria plugin. The history object is also active. It is an lightweight and easy to use library that helps you to display your images in an orderly fashion. 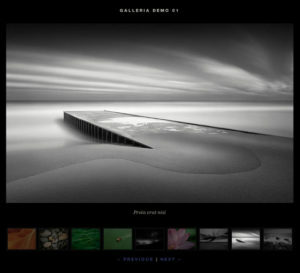 You get full control over how the images are presented in the gallery. You can create your own styles using CSS to make sure that it fits nicely with the rest of the design on your site. I hope that you will like this library as much as I do. This is only one among many on the web so better luck with the next one if you do not.